The health care construction industry remains robust, while emergency room visits are on the rise despite the Affordable Care Act. The seven-story Kaiser Permanente San Diego Central Hospital on 20 acres is expected to be complete in early 2017. The 565,000-square-foot facility will feature 450 patient rooms and a 1,479-car parking garage. The hospital is being built to meet LEED Gold standards from the U.S. Green Building Council. The $456 million Prebys Cardiovascular Institute in La Jolla opened this year. 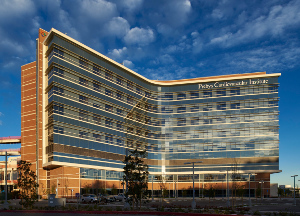 Photo courtesy of Kutch & Co.
UCSD’s Moores Cancer Center has four projects in various stages of completion. The new three-story Center for Novel Therapeutics will serve as a research hub for UCSD and Moores researchers along with private industry scientists. In addition, Moores is building a $120 million, 140,000-gross-square-foot outpatient ambulatory care pavilion on its medical center campus between Thorton Hospital and the Moores Cancer Center. Patients also will now have access to Moores’ doctors in three designated floors and 108 beds within the new Jacobs Medical Center, which will double UCSD Health System’s ability to treat cancer patients. The final project Moores has underway is a remodel at its infusion center and lab in Hillcrest. Construction has been completed on the $456 million, 383,000-square-foot Prebys Cardiovascular Institute in La Jolla and Kaiser Permanente's new 21,531-square-foot multiservice medical office building that will provide care to North County residents. According to executives from the health care industry , the steady pace of building for the area can be expected to continue. The Affordable Care Act was expected to reduce the number of people turning to emergency rooms for care because it would result in millions of Americans securing health insurance and finding primary care physicians. But even as the health insurance rolls have surged, emergency room visits are rising at many facilities nationwide, including in San Diego County. The main reason for the trend is that many of the newly insured are struggling to gain access to primary care doctors, said participants at a recent Daily Transcript executive roundtable. They highlighted that most of those recently obtaining insurance statewide and locally have Medi-Cal, the state's Medicaid program that serves low-income people. Many doctors are deciding not to accept patients with insurance through the program or have long waits for appointments, so those who previously lacked insurance are continuing their pattern of going to the emergency room when they need care. Some participants said that increasing reimbursement rates would alleviate the rising use of emergency rooms because more doctors would accept Medi-Cal patients.